Dog leaving me 3 “traps” and my stepping in 1 as i stepped out of the shower? Check. A LOT of cursing at said dog? Check. By the time I got into the elevator to go to work, I was saying, “Good Morning” through gritted teeth. A full elevator. I was frantically trying to pull down my dress which was caught on my overflowing laundry bag while still telling my dog he was in BIG trouble. I was completely unaware that the older gentleman to my side was addressing me. I was more concerned with getting Bad Dog on his leash and my dirty laundry not falling around my feet. The gentleman asked again, “Does that work with your cellphone?”. My Dexcom sensor was right in his line of vision. 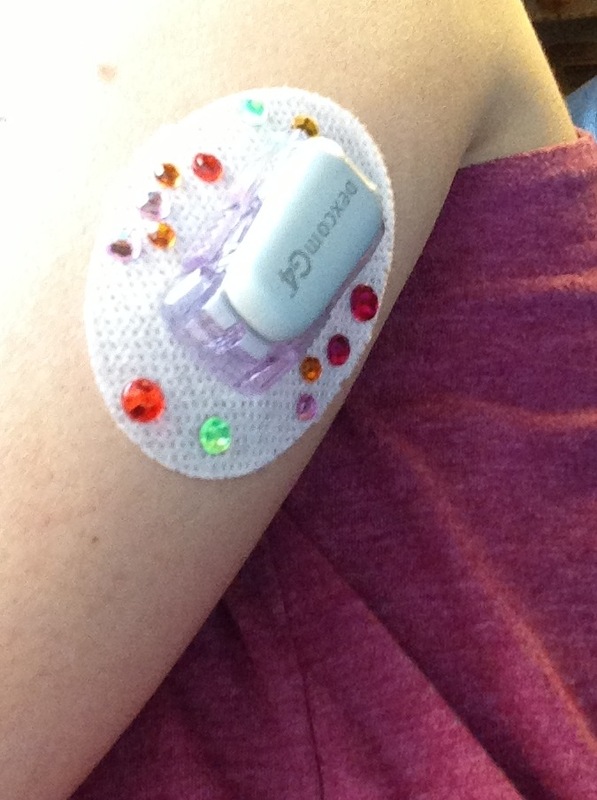 It’s at the beginning of week 2 and kind of a bedazzled mess (hey I take pride in my bedazzled Dexcom designs and this sensor has lost a few rhinestones along the way. I know this because 2 came off in my second shower this morning… you know, the one AFTER I stepped in the dog trap). I now had the attention of the other 2 people in the elevator as well. I explained to the man that it’s a Continuous Glucose Monitor. Seeing the blank look on his face, I quickly added, it tells me my “blood sugar”. Still blank. He quickly said he was sorry. And that he didn’t mean to offend me. We were out the door by this point and I was attempting to explain to him not to be sorry, but I was already losing the laundry bag, Bad Dog was attempting to pee on the front step (!!) and I was fairly certain my favorite, cozy summer dress was pulled-up and flashing my knickers to most of my street. I kept thinking about it. Was he sorry that I’m diabetic? Dude, me too! Well most of the time, me too. No, he was sorry he asked about my cellphone that is inserted into my arm. Like he displayed bad manners or something. I’m in a sleeveless dress. I’ve got a weird looking sensor in my arm. It’s decorated with multi-colored, multi-sized rhinestones. I’m fairly certain this screams, “Ask me what’s on my arm”. Or it screams, “I’m a girl who likes pink and bling and making stuff”. I look forward to seeing my neighbor again. I look forward to explaining to him a wee bit more about my Dexcom and how it’s a great way for me to talk about diabetes technology and why that’s important. I then plan to speak into my arm and pretend I’m taking a call to my Mom. This entry was posted in Dexcom and tagged CGM, dexcom, dexcom bling, dexcom decorations, Diabetes Decoration, DOC, dsma, T1D by surfacefine. Bookmark the permalink. when i was car shopping a few weeks ago. i had the salesman ask me if i was trying to quit smoking…I was like WTH? and he said, i noticed your nicorette patch….I also wear it on my arm and bedazzle the hell out of it…..um, no, I don’t smoke, I said, and as I showed him the receiver which i wear like a dog tag around my neck, that patch sends a message to this here thing and I can see what my blood sugar is 24/7…I think he got it – not sure if he made any connection to diabetes or not…. My daughter also wears her receiver on a lanyard around her neck. A Hello Kitty lanyard, of course! So amazing that you wrote this TODAY. And TODAY I googled “decorating Dexcom sensor” and found your blog. I just photographed my 6 year old daughter’s transmitter and posted the pic on Facebook. Naturally, I wondered of anyone else decorated them. This is only her fourth sensor insertion. We stuck a couple of bling on her transmitter. I just got the call this morning from the Omnipod rep. Our insurance approved her Rx. We have already collected a “bling basket” for her to decorate those, and something today made me allow her to bling Dexie. I wasn’t really sure if doing so was, “okay,” but I did it anyway, and then wondered, “surely others do this too?” Talking into it is hilarious! Ha! I would love to see the look on people’s faces when you speak into your sensor. At the gym I once had a guy point at the infusion set in my stomach and ask me if I had an EKG done that day. He thought the technicians must have left something behind. Then we had a long conversation about my diabetes and my pump. I’ve actually never had an EKG where one of those sensors wasn’t left on me. Weird right?